The Perspective view is used during scene setup. It allows you to see a multiplane scene’s orientation. The Perspective view is similar to a 3D display, as it lets you rotate the scene through all possible angles to understand the spacing between the elements. You can also position and rotate your layers and the camera inside the 3D display to achieve some 3D setup and camera moves. The red circle rotates the view on its X axis. The green circle rotates the view on its Y axis. The blue circle rotates the view on its Z axis. This is a perspective grid reference. The axis reference arrows let you maintain your orientation when navigating in the Perspective view. There are three view option buttons displayed in the lower-left corner of the view. ‣ Show/Hide Camera: Shows or hides camera frame in the Perspective view. ‣ Reset View: Resets the pan, rotation, and zoom of the Perspective view. ‣ Reset Rotation: Resets the rotation of the Perspective view. This field displays the current zoom level in the Perspective view. You can use the Zoom level drop-down menu to select a specific zoom level from the list. 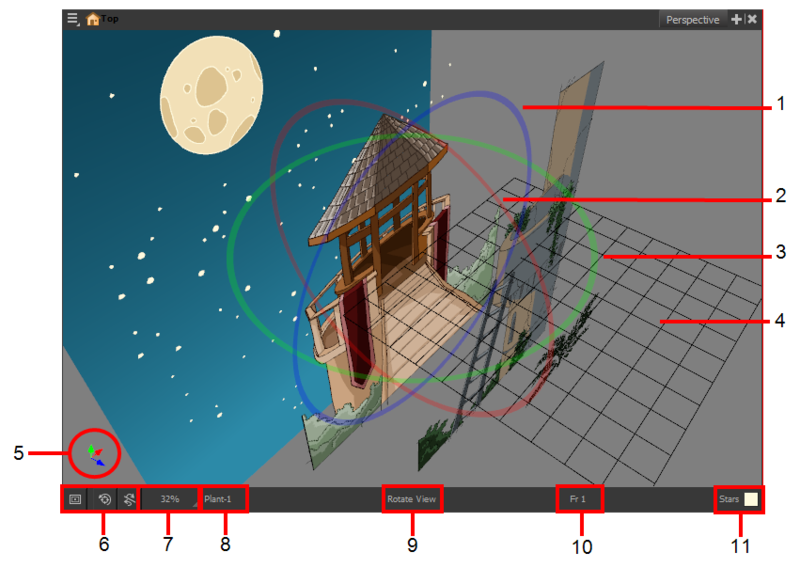 Zoom levels from 2.5% to 6400% are available; you can also select Fit To View to automatically use a zoom level that lets you see all your scene layers and information in the Perspective view at once. This field displays the currently selected layer and drawing name. This field displays the currently selected tool. This field displays the currently selected frame of your animation. This field displays the currently selected colour in the palette. In the Tools toolbar, select the Rotate View tool. ‣ Click in the view, and drag the cursor around to rotate the view. ‣ Press and hold Ctrl + Alt (Windows/Linux) or ⌘ + Alt (Mac OS X) and click and drag to rotate the view one axis at a time.